The Low Center – this is your Center of Gravity, the area right below your belly button. It keeps you weighted and connected to the floor, so that your balance is strong and you can respond quickly with great agility to signals from your partner. It allows your feet to use the floor to power your motion. The High Center – this is your Center of Levitation, the area right around your sternum. It keeps your frame lifted, your chest high and your head up. This also helps your balance, makes you feel “light” to your partner, and gives you a look of confidence and beauty. The challenge? Keep your knees, ankles and hip joints soft and low while you keep your head, chest and arms lifted! For your leg action, picture a baby hanging in a “Jolly Jumper” suspended from the ceiling. His knees never lock to support his weight, they just allow him to compress into and push away from the floor to lift and lower himself alternately, with a feeling of semi-weightlessness. For your upper body action, picture that you are swinging a heavy sack onto a truck bed. It takes a back-to-front swinging action from your whole body to heave the sack upwards, then freeze frame at the top and you’ve got an idea of the lift you’ll need. It can be difficult to focus on both at once, so try alternating what you think about during classes or socials. 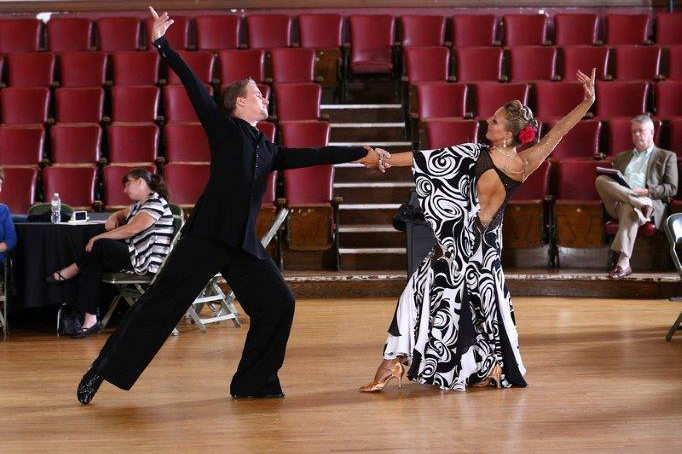 Giving individual attention to each of your centers will give you Roots and Wings for superb dancing!